I've been meaning to play with the Waltzingmouse Fanatics since they launched but failing to get my act together. I also follow the Daring Cardmakers religiously each week and yet haven't played along in forever. So I'm combining challenges just for fun again today. The DCM theme this week is feathers and as I've just treated myself to the WMS Fine Feathers set I thought I should take it as hint that those stamps needed to see ink sooner rather than later! The Fanatics asked for some texture on our projects. I mixed some reinker and Perfect Pearls in a mini mister to make my own shimmer mist and sprayed some cardstock. Once that was dry, I added texture paste through a home made stencil, let that dry and spritzed again with the shimmery stuff. I added some stamped splats and some actual splats flicked from a paintbrush before adding a strip with the stamped sentiment. The feathers are stamped on vellum and cut out (Claire does have cut files as well as matching dies for these stamps but I went for the old-fashioned scissor approach). I cut my stencil from a piece of cereal box cardboard - the intricate die does need a couple of passes on this thickness but it went through and all the pieces popped out cleanly. I've given it a coat of Mod Podge each side and hope it will last for a few goes at least. I could have used acetate but I wanted something a bit thicker to use with the paste. Loving the feathers on vellum and that texture. I have really been enjoying seeing your projects in Craft Stamper, especially when you use WMS as I seem to have an abundance of them! Those feathers are tremendous. Wonderful job of cutting out! A lovely card. Oh my...this is gorgeous! 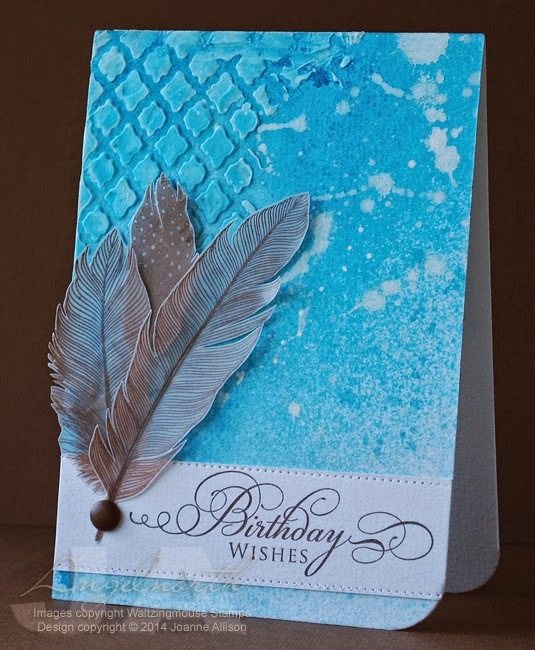 I love the embossed paste pattern and the peacock blue background. The WMS feathers are so soft and pretty...just beautiful! Wowww, this is sooo beautiful! So much texture... Thank you so much for playing along with the Daring Cardmakers this week! Sorry to be so late commenting! This is stunning! 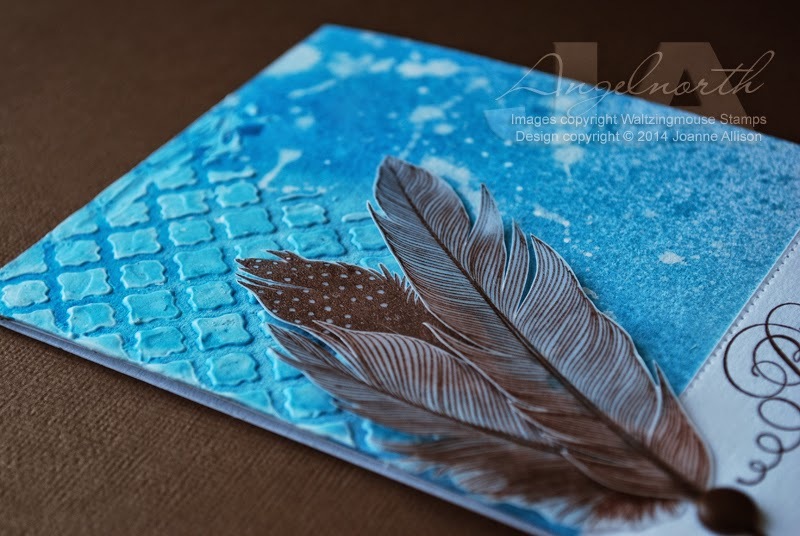 The feathers look so real and I adore the raised texture as well as the textural splats!. Great card. Thanks so much for playing along with Waltzingmouse Fanatics! Sorry I'm so behind on commenting this time around. Your card is fabulous - hits the challenge brief head on! Thanks so much for joining the Fanatics this week. congratulations for your work and new position on Craft Stamper Magazine !